Slot machines have become so common a form of gaming that they've had to constantly reinvent themselves to survive. Themeing has always been a major part of the art of slot machine design. The original slot machine, put together in turn of the century San Francisco by Charles Fey, featured reel imagery which included different types of card symbols in addition to the title theme, the liberty bell. From this grew the largest theme subset of slots, fruit machines. Fruit machines are the well loved, simple little guys, with pictures of cherries, lemons, oranges, and all sorts of different fruit for reel symbols, which for some inexplicable reason seems to relax people. Maybe that's what it's all about, relax people so much they can't get up from the machine! Ok maybe not, but for whatever reason people have loved fruit machines since they started showing up, and it's only started a crazy trend of 'theme to the extreme'. It's almost difficult to find an American icon, sitcom, or pop-culture game-show that hasn't been converted into a slot machine at one time or another. Everything from the Honeymooners to Wheel of Fortune have become slots in Vegas recently, and there's plenty of reason to believe they won't be the last. Popular names attract people, if only for the initial novelty, and drawing new people to the slots is half the battle for casino proprietors. Designing a good game has almost become secondary to coming up with a good theme that fits the demographic. On that side it's sad, because all of this creative energy could be put into creating a more entertaining slot machine for us, but we can't complain too much, those Honeymooners slots are fun. 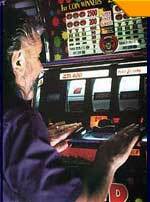 Video slots are a close cousin of our friend, the regular old slot machine. Video slots are slot machines where the mechanisms and reels have all been digitized, so all you're doing is playing on a video screen watching computer graphics wiz by. Many people are disheartened by the artificial nature of these video slots, and crave the mechanical clatter of a real reel slot machine. The thing many of these people don't understand is, mechanical 'real' slot machines are completely digital too. The mechanical parts are all told what to do and how to act by a microprocessor (read, preprogrammed computer chip) embedded in its heart. So a real slot machine is no less digital than a game of video slots. Mechanical slot machines have been run by computers for decades now, ever since it was possible in the first place. So playing video slots doesn't actually take any of the realness away, and doesn't affect the game the way you might think. Basically video slots exist just to provide slot machines capable of even crazier stuff than regular machines. You can imagine with a completely digital display that video slots can have animations in their graphics, and a whole lot more. Try them, you might find yourself a little more entertained while playing slots, which is the point after all right?